More and more home owners are in design mode. They have that itch to change something, whether it be the color of the walls or the type of flooring installed. Well for those interested in making a flooring adjustment, we highly recommend hardwood flooring. 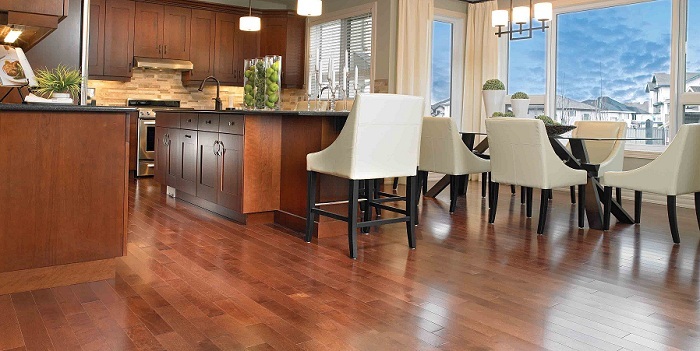 If you already have hardwood installed in your home, you’ve probably noticed how amazing it can be on so many levels. It’s beatiful. It’s easy to clean. It opens up the house. Let’s elaborate a little more on some of the benefits of installing hardwood floors. Hardwoord flooring can last a very long time compared to other flooring materials, including carpet. Its easily cleanable and repairable finishes are a driving factor behind the longevity of hardwood. 100 years from now, you’ll still be walking on the same hardwood floor if you maintain it properly. Everyone loves the look of hardwood flooring. With that in mind, installing hardwood provides an added value to your home. People are attracted to that high-end look and feel. If you’re thinking about selling your home in the future and you haven’t already installed hardwood flooring, you should strongly consider doing so. The time and money spent installing wood floors will be nothing compared the return you get after the sale. With hardwood flooring, you have so many options to choose from. No matter what color scheme you’ve chosen for you interior, there’s a flooring that can compliment those colors. Cherry and oak are two popular choices along with walnut, maple, and hickory. Hardwood floors really improve the air quality of your home. They can trap dust and other breathable materials that make your head hurt. If you have bad allergies, you’ll love hardwood.